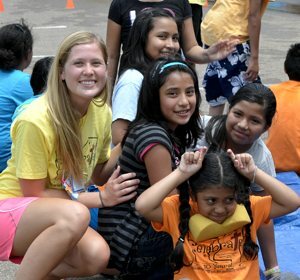 A group of 41 teens, young adults and chaperones from St. John the Baptist in Savage recently spent six days on a road trip to their sister parish, Immaculate Heart of Mary, in the small town of Houston, Miss., to organize a vacation Bible school program for elementary school students there. This was the 10th year that the parish has offered the vacation Bible school and reading enrichment program for the mostly Latino parish community in Houston. They served up to 133 kids, ages 5 to 12, during the four-day program, with the highest number participating on “Water Wednesday” when the afternoon was spent playing water games in the southern heat. The children they serve are mostly from immigrant families and some have to work at a very young age. They say they look forward to this week every summer because they can be kids again for a while, Little said. The volunteers drive vans to Mississippi so they have them available to pick up the students at their homes and bring them to Immaculate Heart of Mary for the vacation Bible school program. The mornings are spent learning about saints and Scripture, playing games, creating crafts and participating in small group discussions. After lunch, the volunteers read with the students one-on-one to help them develop comprehension skills. Funds for the July 6 to 12 trip came from a turkey bingo fundraiser, St. John the Baptist School’s mission carnival and the local Knights of Columbus. During their visit, the group also was presented the key to the city of Houston by Tom Byrne, a city council member and parishioner at Immaculate Heart of Mary. Byrne’s family has provided a pizza lunch on the last day of vacation Bible school for all 10 years the Savage group has organized it. After returning to Minnesota, the group presented the key (actually a picture of a key) and formal declaration to Father Mike Tix, pastor of St. John the Baptist.